Let’s discuss deep depletion in ideal MOS structures for a moment. This CV plot is a high frequency plot showing the difference regular and deep depletion. 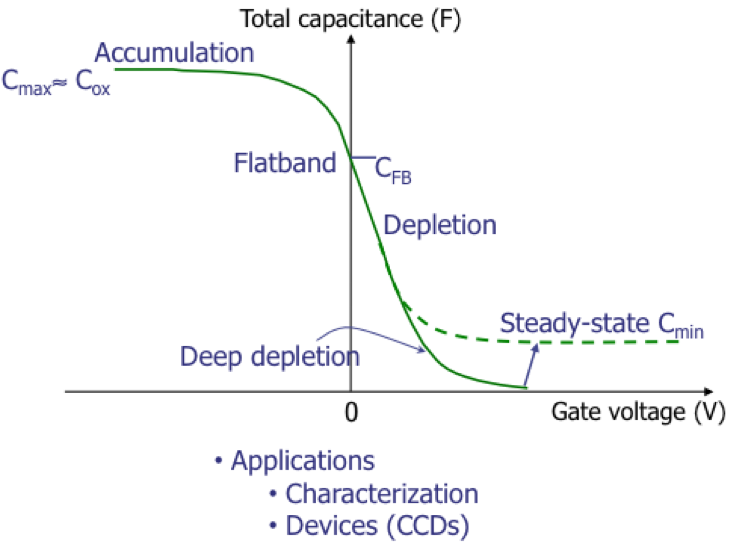 Deep depletion occurs when the supply of minority carriers cannot keep up with the sweep rate. The depletion is deeper than at steady-state. To satisfy neutrality, the depletion width expands deeper, exposing more bulk charge. The capacitance in the silicon decreases to the point where it decreases below the steady-state condition. The capacitance relaxes with time toward steady-state. This relaxation is a measure of bulk and surface quality. There are several applications for this. The first application is characterization. The relaxation is a measure of bulk and surface quality. A long relaxation time equals a long lifetime which indicates less defects. The second application is devices which take advantage of the effect. The most important is charge-coupled devices, or CCDs. CCDs consist of closely-spaced MOS structures. The magnitude of inversion charge is the signal. It can vary from 0 in deep depletion to a maximum value associated with accumulation. The charge is sequentially transferred from one MOS to the other. In imaging CCDs, the charge is generated by incident light. Figure 1, Deep depletion in MOS structures. Sometimes the floor environment is different than the standard values given of 30°C/60%RH. One must understand how to calculate the correct floor life. Let's work ￼through that calculation for parts that pass MSL 4. The packages have a thickness of <2.1mm, and they will be placed in an environment at 30°C/90%RH. Example: Parts pass in MSL 4. Floor life in pkg with thickness <2.1mm, under environment 30°C/90%RH, floor life is 0.5 day. If you look in J-STD-033B in Table 7.1 (Page 21), you should be able to find this part of the figure (bottom part of table). Locate MSL 4 (Level 4), go over to the 90% RH column and locate the row for 30°C. The value reads 1 day, so the recommended total equivalent floor life is 1 day. If you have specified a floor life of 0.5 days, you are within the specification called out by JEDEC J-STD-033B. Q: I need the actual info on: MSL 2 sample (Rel stress soaking: 85°C/60%RH, 168hrs). Floor life is 1 year under 30°C/60%RH storage. What is the floor life if storage under 30°C/70%RH? A: The best way to make this calculation is to use Peck’s Formula to calculate an acceleration factor. The AF (ratio of TF values, 70%RH/60%RH) = (RH70%/RH60%)-a * exp([Ea /k](1/ T70% -1/ T60%]). The temperatures are the same between the two, so only the humidity is a factor. We’ll use 2.7 for a (the humidity exponent) - a typical value for this calculation. So the floor life storage would be 1 year / 1.516 or 0.6595 years (7.914 months) at 70%RH.